Jeremy Framstad from Grace Community Church in Fremont, Ohio brings us this cool geometric use of LED tape. They took their design cues from Josh Feris of Praise Church in Beaumont, TX on this stage setup. Their setup was very similar. First, they needed to figure out their layout and they did that by sketching it out, then putting it into a scaled Photoshop project. When they print it out on 11 x 17 paper, their scale was every ¼” equals 1 foot. This allowed them to know their lengths and distances for their support cabling. They used DMX decoders for each LED strip so they could address them individually. This gave them flexibility in their lighting design. The LED backdrop could chase and each strip could be changed independently of the others. They used 360 watt power supplies for up to 6 DMX decoder per supply. Most of the power supplies had 4 or 5 decoders attached. By building them in this module format it allowed them to swap out components when one went bad. The LED strip lighting was attached to 1×2 that had been painted black. This gave them the rigidity they needed and a way to support them. These were then zip-tied to aircraft cable that was stretched at 5-foot intervals and slid up into place. Using 18/4-thermostat wiring, they extended the LED strip wiring. That can be found at any home store. Do you have any video of the stage in action.it looks really cool in the pictures.I bet the video would really show off you work. There is some footage of the stage in this video. where did you purchase the LED tape from? You can remove this comment… just saw the links… Thanks. How happy are you with the RGBW strips? the strips ive been using make a pretty descent white. I am only curious if it would be worth looking into because the decoders are a good bit more expensive. These are actually just RGB strips. The RGBW I was looking at at the time alternated RGB and W. I wanted more of a color wash. Plus when you turn the RGB all the way up it gets close to white. The main reason that we went with the individual modules was for flexablitlity in our layout and for future projects. We are going to be using those decoders for a project for Christmas and something else in February next year. I am going to be experimenting this fall with different RGBW strips so if you have any recommendations I would love to know what you use. In. The video, what kind of lights are you using to shine down on the lead singer? Thanks! The back lighting from above are Coemar fixtures. The are a mix of 575 iWashes and 250 proSpots. Here is a link to the 90 degree jumpers you were looking for. Can the strip do things like chase and fades? How are those programmed in? As long as each of your LED strip lighting is addressed individually, you can program a chase. This is done in your lighting console. It would be the same as programing a chase with some old par cans. The fade of the chase would also be setup in your lighting console as well. What are the dip switches supposed to be set as? Awesome design. We are trying to do something like this at our church. Do you have pictures of the LED strips connected to the decoders? Thanks for sharing your ideas. They just attach in on the top of those DMX Decoders. R / G / B / Power. I extended the LED Strip lighting with 18/4 thermostat wire from a Home store. I controlled this via Dmx. It comes out of my lighting console, any one will do… I have a zero88 console. Real simple. Dmx out to the dmx decoder. Hey Jeremy, so I am trying to make the fixture on Jands Vista’s lighting software. Now I got the 4 channel version RGBW of the led strip. Can you possibly tell me each channels value for ex. (channel 1 intensity channel 2 red channel 3 blue channel 4 green). I can’t seem to get the encoder to talk to my program. I don’t think there is an intensity channel on those strip lights. An easy way to check is just address the DMX decoder to ch. 1. Push up fader 1-3 on your console and you should be rockin’ all three colors. If you get nothing you probably have a bad signal chain or bad DMX decoder. We are trying this on our stage. We also have a Jands. Did your strips work out for you? Any other suggestion? What strips did you use? The ones Jeremy suggested are currently not available. It depends on your controller. The easiest way to identify what is what, is address the controller to “1” and push channel 1 on a cheap lighting console. Then channel 2 and so on. That will give you what is happening on each channel. I am having the most trouble figuring out the wiring diagram. I have all of the supplies but I cannot figure out how to go from a 3 pin DMX cable to the decoders then to the LED strips.. any help would be appreciate. Thanks! 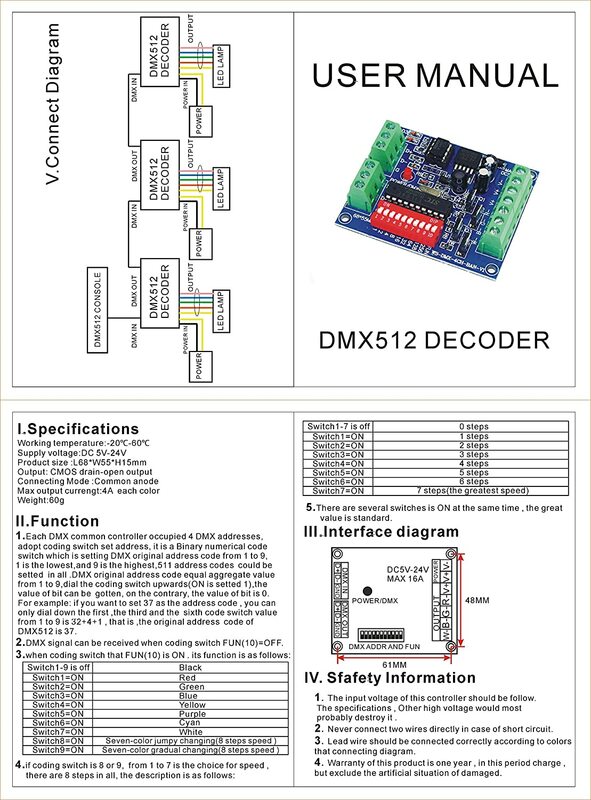 Here is a diagram from the dmx decoder I used. It should get you started on your wiring diagram. Looks great, Is there a limit to how many ft of led strips you connect together per dmx decoder?? We don’t need very many chanels so if I stay under my power supply limit does it matter how much is connected to the controller? Yes there is a limit. Most controllers will tell you how many amps they are rated for. Each LED strip pulls a certain amperage depending on the length. Look at the specs of the dmx decoder, it should say something like 3A/Per Channel or 5A/Per Channel. Hey this is a great idea and design, I am in the middle of trying a similar idea and I was wondering what kind of wire are you using to go from the dmx decoder to the power supply? We used a 14-2 cable. You can get that at any home store. Hi, We are doing a similar design and are having a some issues with connecting of the extension cables to the LED strips.. Would love to some info on how you guys connected everything together. I have a specific question along with Blake. our DMX lighting is XLR type connections. Did you just splice the initial connection from 3-pin DMX connector? and then chain the DMX decoders? We used XLR 3 pin cables to run out other LED lights as well and I cut up and XLR cable and spliced them and hooked them up to the dmx decoders and just daisy chained 4 or 5 decoders together with small jumps. Only problem that occurred was when I used a regular XLR cable I wasn’t able to control the LED tape so after a lot of trouble shooting I took the XRL cable off the I used as the jumps and bought 3 pin dmx lighting cables and used them on the dmx decoders and then everything worked properly and I could control them from my lighting program just fine. So just save yourself a huge headache that I got and start with 3 pin dmx lighting cable. Make sure you use DMX cable it is different than a XLR Mic cable. We just chopped one in half and used it. We also isolated those decoders on their own run. I wouldn’t suggest coming off those and back into your chain. Just link them together. I would also suggest, hooking them up one by one. That way if you miss wire something you don’t have to pull everything apart to find your bad connection. I’ve inserted a link of what extension cable we are using.. I’m just not sure which adaptor to use… Would I need to solder these extensions to a different adapter? I have the quick connect ones it works for the LED strip should we solder the other side? We used the splice kits. and wire nuts. We didn’t solder anything. We used small wire nuts and 18/4 thermostat wire for RGB and 18/7 for RGBW strips. Just extend the leads off your LED strips and put them into your controller. How did you control the LEDs? Did you individually address to a light board? How did you connect the connectors on the led strips to the thermostat wire? We are trying to build this stage design in the next couple weeks and would love to hear from you. The LEDs are controled via DMX Decoders. They were individually address at the Decoder. The LED strips were connected to the wire with wire nuts. You can sober them as well. Good Luck. Send me some pictures. Any chance you could send me the photoshop file sketch that you did of the stage? I’d like to use it to start configuring for our stage? There is a jpg in the picture section. If you post your email address here, I will send you the psd. I would love the PSD as well. We’re getting ready to do something similar at our church and want to make it as versatile as possible. How long are the runs of LED tape on the spool? Check this specs for your LED tape, it should tell you. The ones that I used were 16.4′ or 5 Meters. The psd is located here. Hello Jeremy! Hope you’re great. Love the project. I’m working in a project similar to this one, but I find that that Amazon doesn’t have in stock the necessary amount of led stripes to build the project. Could you check this ones out and tell me if they work just the same? Thanks Jeremy!! Could you check this decoder? It’s different than the one you suggested… Would it work? Thanks again!! I don’t think those decoders are going to work for you. They are only rated at 4 Amps and your RGBW tape is going to pull 5 amps. There is a chance you could get those decoders really hot and start some really great stage effects that you aren’t licensed for… but if you are, could I get your contact info? Try to find a decoder that matches or has I higher rating than the strip lighting you are using. Love the stage design. I am doing a similar one for my church. Question will a Stage Setter 8 Work for this? Yes, That will work, but you might have to address some of the DMX decoders to the same address because your Stage Setter doesn’t have that many channels. Depending on what else you are controlling with that stage setter, it is going to determine how many LED strips you are going to be able to control individually. Hi Jeremy, I have read through pretty much all the comments and tried to gather as much info as possible. I will be doing this exact same project for our church’s summer youth camp but in a smaller scale. I run Daslight DMX software and I am pretty confident that it will work. 1. Doesn’t daisy chaining your decoders only provide one source of signal since the decoders work like a DMX distro for conventional lights “Source4s” unless I am looking at the picture wrong. Does your Power and your 3 (RGB) signals run in one wire which is the 18/4 cable? 2. I am mainly here to get help in supplying the right amount of power and not ruining anything. The guy in this video uses basic wall power supplies. What would you suggest I use (high amp/watt rate PSUs**like yours OR a lot of small wall PSU). Again I am planning on doing the same design just have the scale. 3. What is the advantages/disadvantages of using pre built dmx decoders and the decoders that you’re using, besides the fact that you have to splice DMX cables in yours. Video attached shows the decoders I want to get. Thank you Jeremy. You’re awesome for posting this and putting the effort in helping others here. Be Blessed. I ment half the scale you guys are doing** (6′,3′,1.5′). Forget question 1. I got it. They way we set up our system is each of the dmx Decoders had a different address. So Decoder 1 – channel 1-4 / Decoder 2 – channel 5-8 / Decoder 3 9-12 / and so on. This is the DMX cable or control cable. The Decoder translates the DMX control to a power voltage. So if you tell your dmx console to output 50 percent on channel 1, the dmx decoder sends 50 percent to the Red LED lights on Strip 1. If you were to send 50% on DMX channel 6 from your console, the second DMX decoder would send 50% power to the Green LED lights on Strip 2. (Assuming you are using 4 channel decoders and RGBW LED Strips. That power is sent out of the decoder via the 18/4 or 18/5 cable. One wire for Power, and then a cable for each color. For Power supples, just make sure you do the math. You can individually power each strip if you want, but if you are using a DMX decoder that has multiple LED strip light connections, those individual wall power supplies won’t work for you. Is there a installation video anywhere? We didn’t make a video when putting this together. I know its been a while since you guys have had this stage set up. I was wondering if you still have all the material that you used for the set up? We have a limited budget and are planning on shifting to a similar design for this upcoming year in our youth room. Would you guys be willing to sell it? Is it still functional? We are a church in Dayton, OH. We have this set all broken down and we use the components and pieces on other stages and venues at our campuses. Next time you are up in Northwest Ohio stop in a say hello. I’d love to show you our church and hear about yours. Awesome! Would you be willing to spend a bit talking on the phone? I have a few quick questions about the set. Love the design and am getting ready to do a similar design myself. My question is if the LED strips were already black to to blend into the framing? Yep. You can get the LED strips in black. That’s what we did with ours. Can you describe a little bit more about how you attached the frames to the aircraft cable? I know you mention using zip ties but it seems they would have a risk of slipping down the cables. This is fantastic. I am the worship pastor at a church in Osage Beach, MO. I have some background experience in DMX lighting. The youth pastors, some key volunteers and I are planning to implement this by the end of February 2017 in time for Lent. We are excited; we are grateful for all of the instructions, the list of supplies, and the photos, as well as the comments. Thank you for posting and allowing us to use your creative ideas. Can’t wait to see what you guys come up with. Send me some pictures! Jeremy, love your design. We are setting up something similar for Easter. The LED strips you used are showing not available. Do you have another recommendation? Your original post was a while back. Gained any other wisdom since then? Appreciate your talent! You should be able to find some cheap 5m RGB strip lighting anywhere on ebay or amazon for under 10.00. My suggestion is to order one of everything, demo it, and then purchase the rest. Always buy extra, because you are going to need it. What gauge aircraft cable did you use? Also, you mention spacing them 5 feet apart. Did you start from center? We used 3/16 cable on this set. We put one cable in the center and then went 5′ off of center. Question regarding the stripping of the waterproof material on the strip lights cleanly when needing to add a cut or corner connector. Any tips on cleanly cutting through the silicone, and removing it to expose the cut point cleanly? Hello we have done something like this as well. Works pretty but notice some flicker and as well our guitar players are generating noise through their guitar pick ups when the light strips are changing colour or intensity. Did you have any issues such as this?